BA (Hons) Business Management graduate Louise had taken time out to support her family and be at home with her children but later decided she wanted a career. 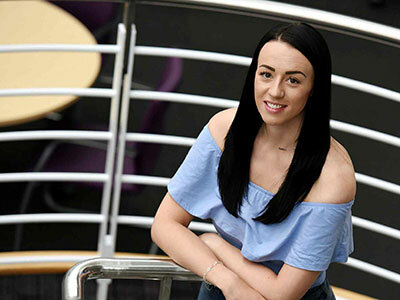 She completed an Access to Higher Education course before applying to Teesside University. Louise, who grew up in the village of Caldwell in North Yorkshire, is now embarking on a new career on the Police Now leadership scheme for graduates at Northumbria Police. The two-year national leadership programme trains outstanding graduates to become Police Officers. Its mission is to transform communities, reduce crime and increase the public’s confidence in policing. Reflecting on her time studying, Louise says that university has changed her life in more ways than one. 'Being at university has helped me in all aspects of my life. My children have a more confident, happy mum who is showing them that they can do anything if they put their minds to it. You’re not just defined by the roles you have had previously,' Louise explained. For Louise, her experiences and the people she has met along the way have been the highlight of her time at university. She added: 'I welcomed every opportunity that came my way and engaged with everything that I could while I was at university. 'I have made some wonderful contacts and friends for life through volunteering, along with professional friends who helped me complete my dissertation.